The randomized PARTNER trial demonstrated similar long-term clinical outcomes in high risk patients with aortic stenosis undergoing transcatheter aortic valve implantation (TAVI) and surgical aortic valve replacement (SAVR). At 5 years, in patients with mean Society of Thoracic Surgeons Predicted Risk of Mortality (STS) score of 11.7%, mortality and stroke rates were not different between the two groups. The subsequent randomized PARTNER 2 trial considered intermediate risk patients with aortic stenosis (mean STS score of 5.8%). The primary end-point of death or disabling stroke at 2 years was similar in patients undergoing TAVI and SAVR (HR 0.89; 95% CI 0.73-1.09; p=0.025). TAVI was associated with lower rates of severe bleeding, acute kidney injury and atrial fibrillation as well as shorter hospital stay. TAVI performed by the femoral route resulted in a lower rate of death or disabling stroke than surgery (HR 0.79; 95% CI 0.62-1.00; p=0.05), suggesting that TAVI may be superior to SAVR in the early to mid term if the patient has vascular anatomy permitting a transfemoral approach. However, TAVI was inferior to SAVR with regard to vascular complications and frequency and severity of paravalvular aortic regurgitation. (2) Of note, in the 5-year PARTNER trial follow-up, poorer outcomes were associated with greater severity of paravalvular leak. 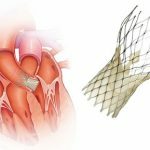 A recent report from the Society of Thoracic Surgeons/American College of Cardiology (STS/ACC) Transcatheter Valve Therapy (TVT) Registry published in JAMA Cardiology, showed that most surviving patients undergoing TAVI had large improvements in health status at 30 days which persisted to one year. Although there was significant missing follow-up data, the authors concluded that the quality of life benefits with TAVI observed in clinical trials appear to translate into real world practice. (3) The PARTNER 3 trial is currently recruiting patients to evaluate the safety and effectiveness of TAVI in low risk patients (<2% operative risk) with aortic stenosis. If randomized trials demonstrate comparable outcomes for SAVR and TAVI in low risk patients, and if TAVI technology continues to evolve reducing frequency and severity of paravalvular leak, we may expect to see rapidly increasing transcatheter procedures and declining surgical referrals for severe aortic stenosis in the future. Mack MJ et al. 5-year outcomes of transcatheter aortic valve replacement or surgical aortic valve replacement for high risk surgical patients with aortic stenosis (PARTNER 1): A randomised controlled trial. Lancet 2015;385:2477-84. Leon M et al. Transcatheter or surgical aortic-valve replacement in intermediate-risk patients. N Engl J Med 2016;374:1609-20. Arnold SV et al. Quality-of-life outcomes after transcatheter aortic valve replacement in an unselected population. JAMA Cardiol2017 (online ahead of print). In this edition of Cardio Debate, comparison is made between transcatheter aortic valve implantation (TAVI) and surgical aortic valve replacement as treatment for severe aortic stenosis. The results of the PARTNER trials are summarised and show that high risk patients had similar long-term clinical outcomes and intermediate risk patients had similar survival and stroke rates at two years. There are other clinical trials comparing (TAVI) with surgery, notably the US Pivotal Trial, which for the first time suggested that TAVI could have superior outcomes to surgery in high risk patients. A recent Meta-analysis of four randomised TAVI -v- Surgery trials in the European Heart Journal by Siontis and colleagues studied the results of more than 3000 patients receiving transcatheter or surgical valves. The analysis demonstrated a consistency of benefit of TAVI over surgical aortic valve replacement through two years of follow-up with benefits particularly marked in those undergoing a transfemoral as opposed to a transthoracic approach, and intriguingly in females. For high risk elderly female patients, the pendulum has swung unequivocally in the TAVI direction and it is likely that benefits over and above surgery will extend to males and intermediate risk patients as further trial data becomes available.